Metroid Prime: Federation Force is a first-person shooter developed by Next Level Games and published by Nintendo. 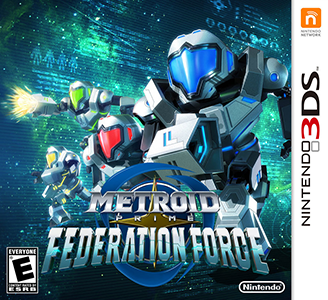 A spin-off of the Metroid Prime series where the player assumes the role of a Galactic Federation Marine sent on missions to defeat the Space Pirates. It includes a multiplayer soccer-based game mode known as Metroid Prime: Blast Ball. Metroid Prime: Federation Force has issues in Citra. The game requires powerful hardware to obtain a meager framerate, and has broken texture forwarding, meaning it does not benefit from higher internal resolutions.